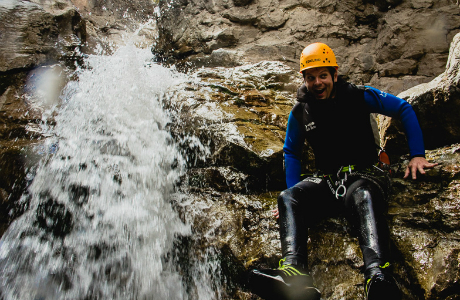 Join Canyoning Colorado in Ouray and enjoy the outdoors and the natural environment of canyons. 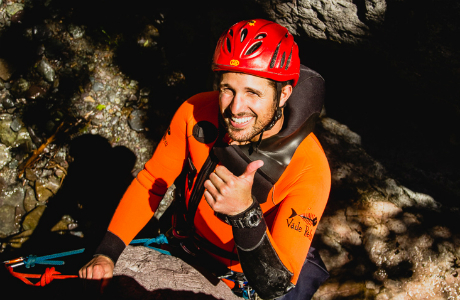 There are many ways to explore and move through canyons, including rappelling, walking, scrambling, and swimming. 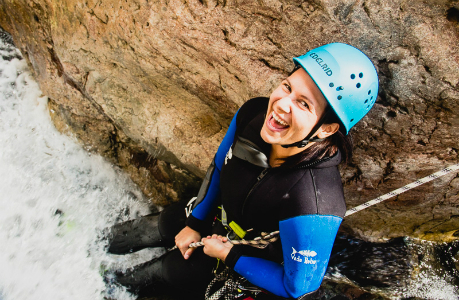 Let the Canyoning Colorado team show you why Ouray County is world-famous for canyoning / canyoneering. 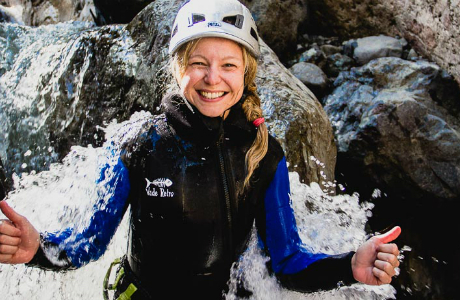 Half day Beginner Canyoning Trip in Portland Creek. 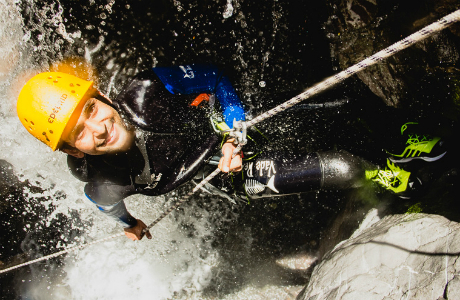 This canyon is the ideal environment for a half day canyoning trip; it is a short 15-minute walk to the start of the canyon from the parking lot. The first half of the canyon will greet you with stunning limestone walls that rise 20 feet above you. We will warm you up with some downclimbing, scrambling, and a practice rappel. The second half of the canyon is where things ramp up a bit. As soon as the narrow passageways of the canyon open up, you'll undertake a 55 foot waterfall directly under the flow! At the bottom of this waterfall, you'll be deep inside the second half of the canyon with towering 60 foot walls. You'll walk in amazement at the depth of this canyon. When you reach the end, it requires a small climb out, and then a quick 10 minute walk back to the parking lot. No previous experience is required. We provide all the equipment, please provide your height, weight and shoe size at the time of booking. Canyoning Colorado LLC operates under a Special Use Permit from the Uncompahgre National Forest. Located across the street from Alpine Bank at 920 Main Street, Ouray, Colorado. Please arrive at least 15 minutes prior to check-in. Written Cancellation Policy | 6.1 All cancellations or changes of contract made by the customer must be notified to the organizer in writing before the start of the tour. 6.1.1.2.1 A valid doctors note must be supplied within 7 days of notification of cancellation, or a 100% cancellation cost will apply. A refund is only applicable to the customers party of whom the sudden illness or injury applies to. 6.1.2 If the customer ceases the activity at any time during the tour, they shall not be entitled to a refund. 6.1.3 If the customer fails to appear for the scheduled departure time, they shall not be entitled to a refund. 6.2 The organizer reserves the right to cancel the activity or withdraw from the contract at any time. 6.2.1 If the organizer cancels the activity or withdraws from the contract because the customers behavior, omissions, or other actions can or are jeopardizing the safety of any customer or staff, then the customer shall not be entitled to a refund. 6.2.2.2 The option to reschedule to an activity where the space and time is available. 6.2.2.2.1 If a different activity or service is chosen from the initial contract, an additional cost or refund will be given in accordance with the difference in price. Written Deposit Policy | Paid in full at time of reservation. We display personal testimonials of satisfied customers on our site in addition to other endorsements. With your consent we may post your testimonial along with your name. If you wish to update or delete your testimonial at any time, you can contact us at info@canyoningcolorado.com. We display images from our canyoning tours on our site and Canyoning Colorado social media sites, such as Facebook, Instagram, TripAdvisor, Google+ etc. With your consent we may post your image. If you wish us to update or delete your image, you can contact us any time at info@canyoningcolorado.com. Sensitive information such as credit card data is not collected on http://canyoningcolorado.com. We have selected industry professionals to handle your personal data. When booking online you are re-directed to Bookeo, which is a booking management system. All online payments are processed by Stripe, who securely handle your credit card data. Technologies such as: cookies, beacons, tags and scripts are used by Canyoning Colorado and our marketing partners, affiliates, or analytics or online customer support providers. These technologies are used in analyzing trends, administering the site, tracking users movements around the site and to gather demographic information about our user base as a whole. We may receive reports based on the use of these technologies by these companies on an individual as well as aggregated basis. Cookies can be controlled in your individual browser settings. If you reject cookies, you may still use our site, but your ability to use some features or areas of our site may be limited. When we partner with a third party to either display advertising on our Web site or to manage our advertising on other sites. Our third party partner may use technologies such as cookies to gather information about your activities on this site and other sites in order to provide you advertising based upon your browsing activities and interests. If you wish to not have information used for the purpose of serving you interest-based ads, you may decide to opt-out of such programs by visiting TRUSTe.